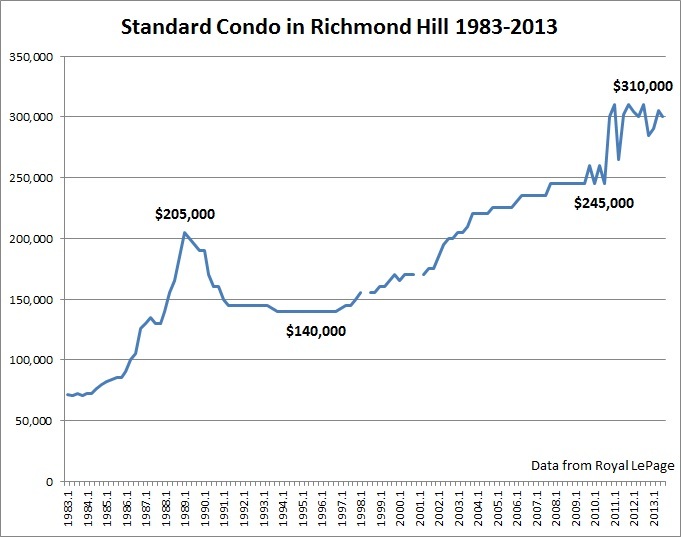 Richmond Hill as Delusional as Vancouver? 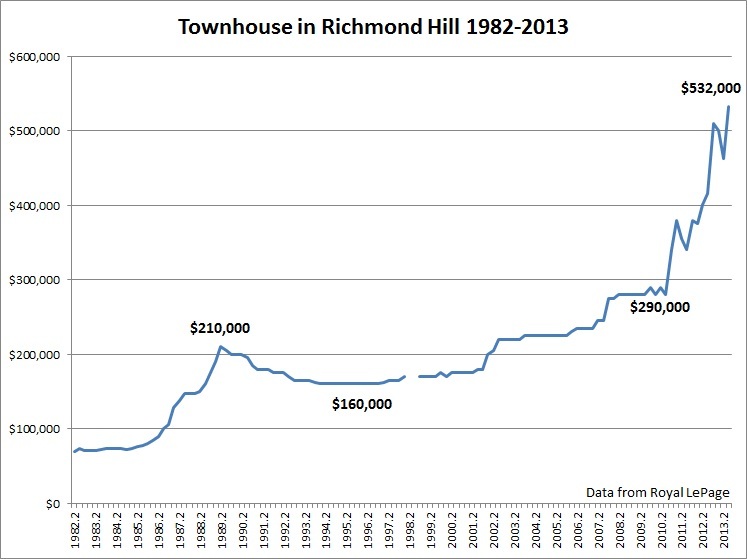 If Toronto were the US in the midst of a housing bubble then Richmond Hill would equate to Phoenix or Miami. When I first graphed the data from the Royal LePage survey, I thought no way this is right! Once I checked and double checked, I was like no way! Then I remembered the above quote by Ben Rabidoux. Made me wonder whether the charts below are proof of it. 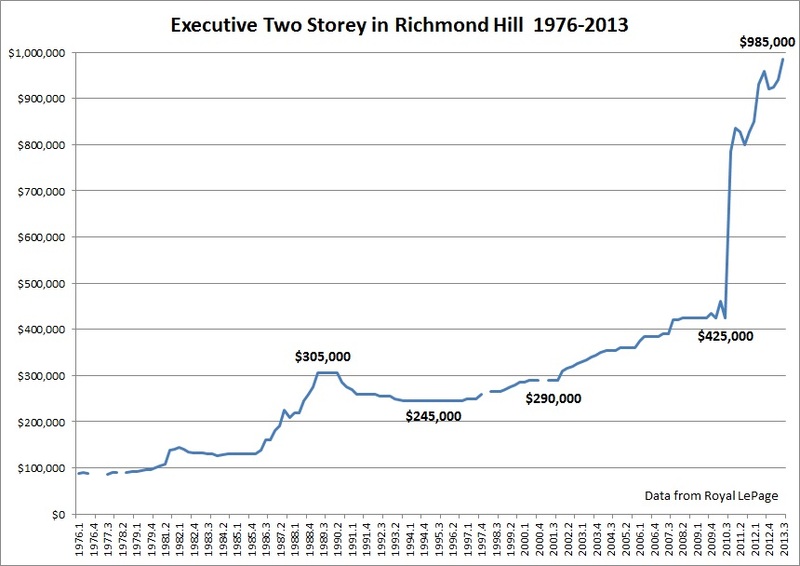 Executive Two Storey in Richmond Hill up 131% since 2008. Executive detached two story floor area approximately 2,000 sq.ft (4 bedroom). Includes a two car garage. 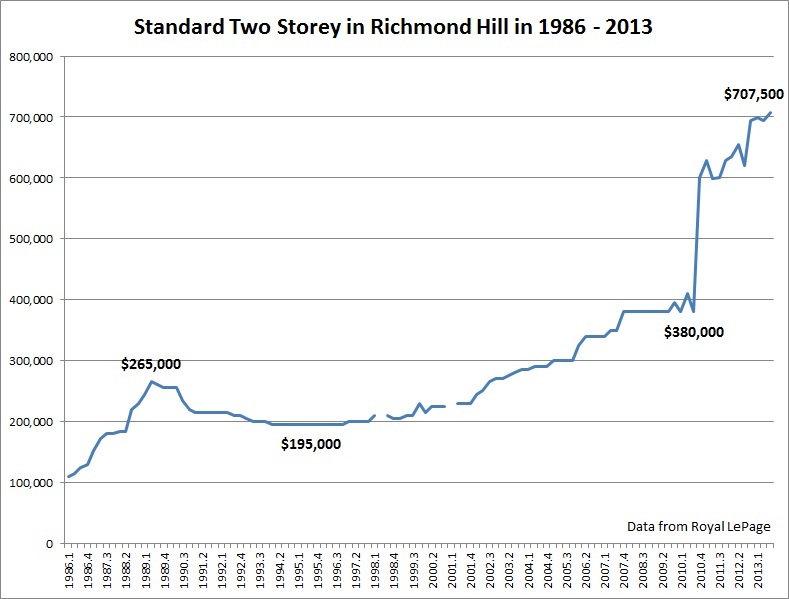 Standard two storey up 86% since 2008. Standard two storey floor area approximately 1500 sq.ft (3 bedroom) with a detached garage. Bungalows Up 71% since 2008. Bungalow floor area is approximately 1200 sq. ft. (3 bedroom). 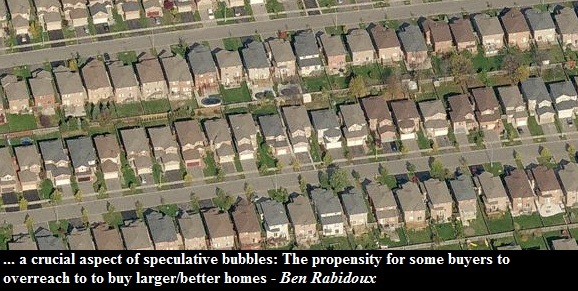 Townhouses Up 90% since 2008. Total area for a townhouse approximately 1,000 sq.ft. (3 bedroom). 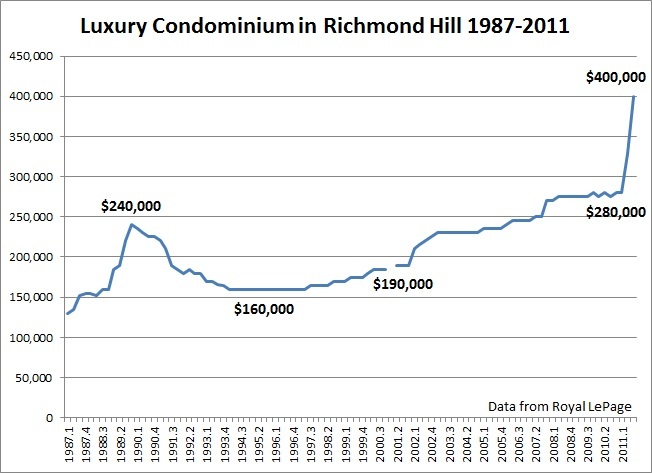 Luxury condos Up 45% between 2008 and 2011. Up 116% since 2000. Note that there was no data beyond 2011. Approximate area 1,400 sq.ft. with 2 full bathrooms. Standard condos up 22% since 2008. Approximate area 900 sq. ft. I know what you might be thinking. Real estate agents from the Royal LePage were smoking crack and made that data up and that the above charts do not reflect reality. I thought so too so I looked at a data set from TREB to double check whether or not there was explosive price growth in Richmond Hill. 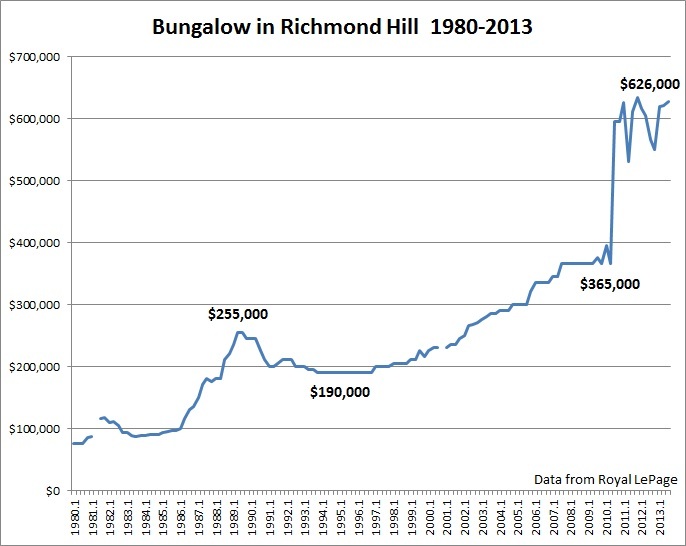 Long story short - the average resale detached home price in Richmond Hill was up 87% since 2008. Keep in mind that treats bungalows, executive two storey and standard two storey homes as the same. 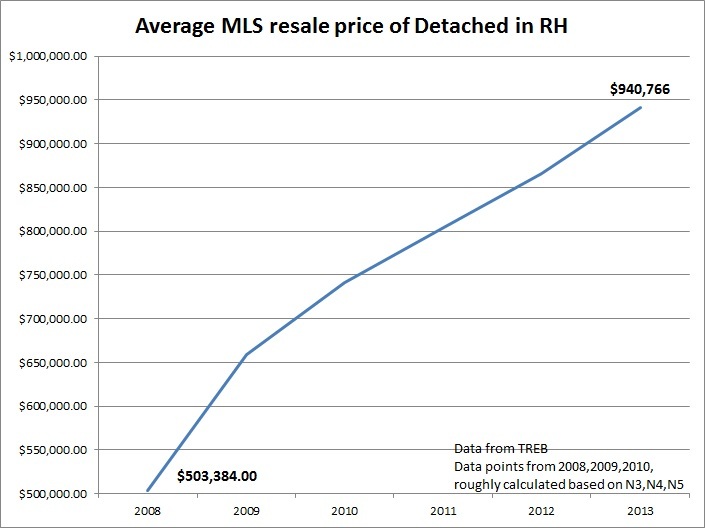 Note that TREB changed the geographical districts in 2011 so I had to roughly calculate the average home price for a detached home in RH. I used average data from N3, N4, and N5 for 2008 ,2009 and 2010. For 2011, 2012 and 2013 I used data for Richmond Hill. So is Richmond Hill in la-la land or is there something that I don't know? In case you know something I don't leave a comment below!